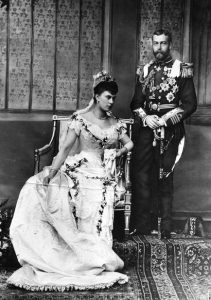 Following our first instalment of ‘British Royal Wedding Look-Backs’ – Edward VII and Alexandra – yesterday, the TRF Blog would like to present our readers with the second instalment, looking at the wedding of His Royal Highness Prince George, the Duke of York and Her Serene Highness Princess Victoria May of Teck. 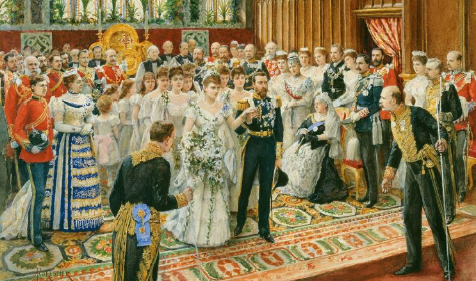 On July 6th, 1893, the wedding of Prince George of Wales and Princess May of Teck took place in the Chapel Royal at St. James’s Palace. Prince George was the son of The Prince and Princess of Wales (Edward and Alexandra) and Princess May was the daughter of the Duke and Duchess of Teck (Princess Mary Adelaide of Cambridge and Francis, Duke of Teck). Prince George of Wales, was created the Duke of York by Queen Victoria in May of 1892. The couple was married for forty three years and had a happy, loving and fruitful marriage despite its rather unusual beginning. May, you see, had previously been engaged to George’s eldest brother, Prince Albert Victor of Wales. Six weeks before their wedding (scheduled to take place on February 27, 1892), Prince Albert Victor (known as Eddy) died of complications from influenza. After a decent mourning period, George and May became engaged in what The Times called “a union rooted in painful memories that may prove happy beyond the common lot.” On the morning of their wedding, George accidentally caught sight of his fiancé down at Buckingham Palace, and made “low and courtly bow,” a gesture Mary never forgot. The bride wore white satin brocade embroidered with silver roses, thistles and shamrocks, festooned with orange blossom. The skirt, opened at the front, revealed a white satin underskirt and a full train. She also wore the same bridal veil that her mother, the Duchess of Teck wore in 1866. Prince George wore the naval uniform of a Captain of a Naval Fleet and both his father, The Prince of Wales and his uncle, the Duke of Edinburgh, wore the naval uniform designating that they were Admirals of the Naval Fleet. Princess May of Teck’s attendants were Princesses Victoria and Alice of Battenberg (mother of Prince Phillip), Patricia and Margaret of Connaught (future Crown Princess of Sweden), Princesses Alexandra, Beatrice and Victoria of Edinburgh, and Princess Helena Victoria of Schleswig-Holstein. Princess May of Teck was escorted by her father, the Duke of Teck, and her oldest brother, Prince Adolphus of Teck. The couple was married by the Archbishop of Canterbury, who was assisted by the Bishop of London, the Bishop of Rochester and additional religious figures. The couple received many extravagant wedding gifts, including the well known “Girls of Great Britain and Ireland Tiara” a personal favorite of the Queen’s. George and Mary were the parents of Edward, Albert, Mary, Henry, George and John. Upon the death of his father, King Edward VII, he succeeded to the British throne on May 6, 1910. At that time, he took the name of George V and Princess May became Queen Mary. They were the parents of two kings: Edward VIII and George VI and of course, the grandparents of Queen Elizabeth II. Tagged George V of the United Kingdom, Mary of Teck, Teck, Wedding. Want a Piece of Royal Wedding Cake? Will Secret British Royal Wills Be Unsealed? My cousin has a portrait photograph of king George V with queen Mary from 1911, i think it is very rare picture.